Just a little note to say hi to our beautiful Angel. Hi baby. Thank you so very much for guiding your sister to us safely. She is a joy and a blessing and I see you each time I look at her. There are many times now that I can think of you and smile, but today are just tears. Tears for our baby boy whom I miss with every inch of my being. Tears for another New Year without you. Tears for the time that insists on marching along... leaving you further and further behind. Sally said it best the other day. I am happy. I am sad. I am lost. I am found. I am hopeful. I am pessimistic. I am grateful. I am pissed. I love her..... I love him. I enjoy her fully. I miss him desperately. I could go on and on. The contradiction of emotions is exhausting in itself. I suppose it will always be that way. One feeling trying to overpower the other. Today, although it may seem selfish and ungrateful for the miracles we do have, the sadness and unfairness of it all seems to be winning out. I have to say that it doesn't help at all when Nicholas and his memory are so blatantly ignored. I find myself often highlighting things of his, momentos, pictures of him when certain people come into our home. I will light his candle, mention his name.... and still, nothing. Not a word. Not an acknowledgment. Not an "oh my, isn't that a lovely family photo" or "Nicholas' memory table looks beautiful". Not even a mention of his name. It breaks my heart. Plain and simple. And Madison is here. She is gorgeous. She is healthy. She is growing.... We are incredibly lucky. The same certain people ooohh and aahhh over her. They cuddle her and love her and speak her name. They do this because she is here. She is alive. There is only happiness and relief over her safe arrival. Maddie deserves this. She is our hope, our chance to continue to heal our broken family. It's a happy ending. It's much easier for some people to accept this fate, a beautiful, healthy baby, home where she should be than a baby who died. It just literally makes me sick to my stomach that Nicholas does not get the same respect. That we do not get the same respect. That because his was a sad, sad ending, that he doesn't deserve mention. He is a part of our family, dammit. He is our son, our precious, sweet Angel who deserves every little bit of respect and honour as the rest of our family. And then the request to send pictures of Madison as she grows.... I don't have any desire or inclination to keep anyone in the loop of our family when a big part of our family, Nicholas, is totally and deliberately ignored. Okay... think I'm done for now. Wishing you all a safe and peaceful New Year. I am looking forward to posting more about our Christmas blessing, Madison, and definitely will in the next few days, but tonight I would like to take a moment and wish you all comfort, strength and peace on Christmas Day. I am confident that all of our Angels are wishing their mommies the same this Holiday. From our Angel to yours... Merry Christmas. 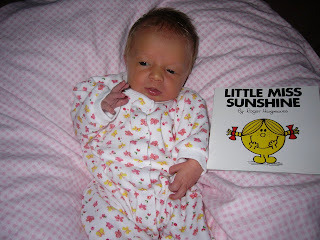 "Little Miss Sunshine" decided to make an early debut! 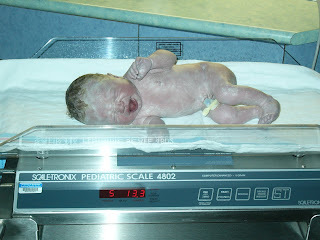 Madison Nichole was born on December 17 at 12:58am. 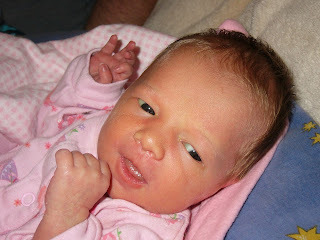 She weighed 5lbs 13oz and looks exactly like her brothers... although much more petite! 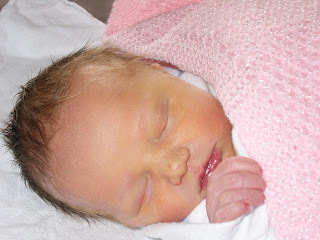 Madison had to go the NICU for a couple of days as she had quite a bit of mucous in her chest. She was given some extra oxygen and was given a course of antibiotics to rule out a chest infections. 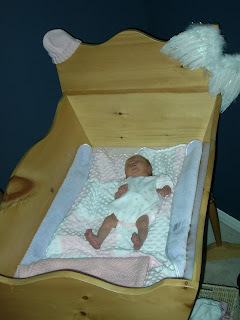 She is doing really well and we are now home... trying to establish some kind of organized chaos. Christmas is sure extra special this year! Thank you for all of your love, support and guidance throughout this latest journey. 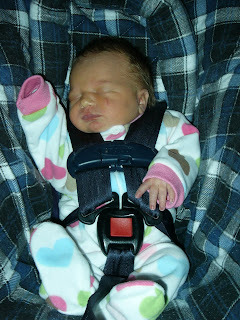 We are so very blessed to have our precious girl here with us, safe and sound. Thank you, Nicholas for the extra special role you have played in bringing your baby sister home to us. 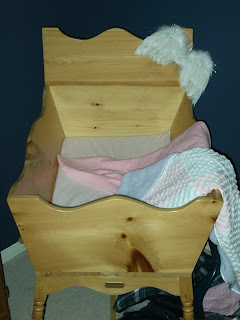 I think I have mentioned before that my brother made us a beautiful wooden cradle when we were expecting our first son. It has been well used, as we are now passing it around the family when the time arises. Each baby born and to use it has their own gold initial plate embossed on the side of it. I will forever be sad that Nicholas' initials will never appear on such a family heirloom... although, one day, I think I will get an "In Memory" plaque and find a special spot on the cradle for it. I have now prepared it for "Little Miss Sunshine". It sits ready and waiting for our new arrival to come home, as it has done for all of our children. I remember pleading with my brother to come and get it out of our house when we found out about Nicholas' diagnosis. I knew I wouldn't be able to bare looking at an empty, yet so ready, cradle when we got home from saying good bye to our son. It was difficult to get it back, put it in the same spot in our bedroom, clean the linens and prepare it all over again, but also somewhat healing. In the next few weeks it will be filled with a gorgeous baby girl... at least that is our eternal hope. After to come in a few weeks! Today we are 35 weeks pregnant with Little Miss Sunshine. At 35 weeks we met and said goodbye to our sweet Nicholas. I can't help but think back to my pregnancy with Nicholas and think... at 35 weeks, that was it. We were forced to say goodbye. God willing, we will make it past today with Little Miss Sunshine. Past the 35 week mark. Nicholas, please keep your little sister safe. I've been through it 3 times. All different experiences. All distinctly unique. With Little Miss Sunshine's impending arrival, I have been thinking a lot about the birth of my children. Flashing back to some of the most beautiful moments of my life. 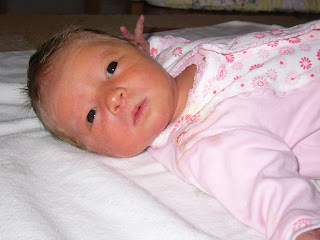 Overall I have been pretty lucky in terms of labour and giving birth. 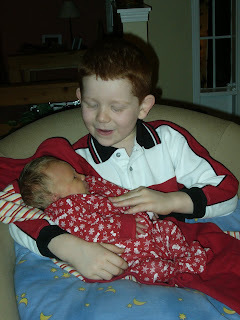 Our oldest son was born 2 days after his due date, on December 10, 2003 (yes, he will be 6 on Thursday! Unbelievable). I had been into the hospital several times the week before for non-stress tests on the baby as my OB did a little more prodding than he should have done during my last exam. On the evening of December 9, I remember walking the hall from our master bedroom down to the guest room in considerable discomfort for several hours. My husband was "busy" watching the hockey game and assured me that he could watch the end of the third period before we had to make the 3 minute trip to the hospital. So much for first time daddy jitters! Turns out he was right. 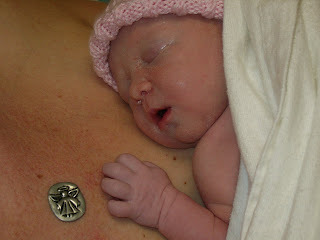 I laboured/slept after an epidural, for 8+ hours before our first beautiful red head was born. I ended up pushing for over an hour because the OB was too busy to come and give me the "snip" I so desperately needed.... that's all it took and out he came. Because he was stuck in the birth canal for so long he swallowed some mecconium and was taken directly to the Special Care Unit for oxygen and antibiotics. 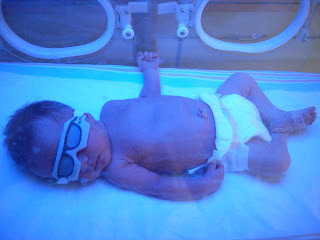 I remember overhearing the nurses questioning whether or not they should take him.... I just screamed "if there is ANY question, then please take him". I was heartbroken that I didn't have that instant contact with my baby boy. I saw him briefly and then he was gone. The only thing that made me relax is that my husband went directly with him and my mom stayed with me. He was in the Special Care Unit for 2 days and responded well to treatment. The image of seeing him in an oxygen tent with tubes and monitors hooked up to him haunted me for the longest time. Little did I know we would experience much worse. Our second son was born in February, during the Olympics of 2006. I woke up at about 5am feeling somewhat uncomfortable and assuming that it was the 'start'. I got up, walked around, called my mom to let her know she was needed on 'standby' and then jumped in the shower. In the shower my contractions jumped from 8 minutes apart to approx. 4 minutes. My husband called my mom back and scratched the 'standby'... we needed her now! We arrived at the hospital at 8:30am and I had him at 11:30am. Quick and very easy. 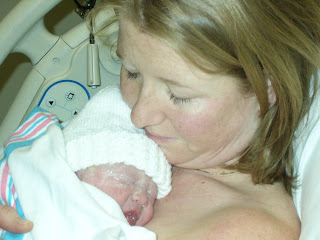 Nicholas was induced at 35 weeks and it was, by far, the most difficult and long labour experience of them all. For obvious reasons, I was a disaster which didn't help labour progress. My body, my heart, my soul, didn't want to let go of our third baby boy. My body wouldn't relax enough to allow contractions... my heart wouldn't stop hurting enough to let my body do what it needed to do. We went the entire afternoon, evening, night and next morning without much movement. Quite possibly Hell on earth. The doctor gave me an epidural as soon as they started the induction process so that I wouldn't physically feel any more pain than I had to. They gave me my own dosage pump, which meant I could press a button if I felt anything and I would automatically be injected with more medicine. I remember dozing in and out of sleep from pure exhaustion, my husband sleeping and holding my hand the entire night. I remember every so often waking up and thinking that I should be pushing this self medicating button right now.... the contractions were becoming stronger.... but on some level I wanted to feel them... I needed to feel the pain. I owed Nicholas that. Something. Anything. I felt like I wanted to remember his birth, wholly. I refused any kind of relaxant medication. I needed to be aware. To be alert and ready to love our son when he was born. 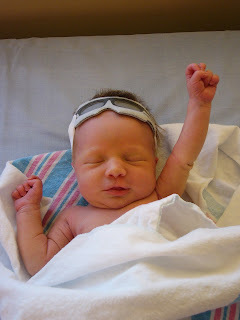 And so, for the most part, I let the epidural run thin. I honestly don't remember much physical pain. 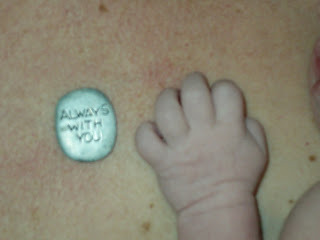 The emotional pain of knowing our son had already passed overtook any other feeling I could have felt at the time. My mind was numb, my body was numb and although my heart was in a million pieces, I still, undeniably, felt that unconditional bond with our baby boy. That love that is the strongest in the universe. The love between a mother and her child. I can only anticipate how Little Miss Sunshine's labour will progress. I have a strong feeling that she will make her debut early... and she will make her debut quickly. I have been having very intense braxton hicks/false labour contractions for the last couple of weeks, which, to me, is a signal to be ready any time now. Who knows, maybe it's wishful thinking. Now that we are past the premature stage I may just be getting selfish. I want our new blessing here. In our arms. Strong and healthy and wailing her lungs out. Is that too much to ask? I am constantly overwhelmed by the care, compassion and support that permeates through this baby lost community. I have "met" so many women, most living miles, even oceans away, that have selflessly offered understanding, kindness and heartwarming goodness. All of this is offered amidst their own suffering. I am humbled beyond words. The experience of losing Nicholas has brought to light the genuine, kind, spirit of others. Something that so often goes unnoticed. 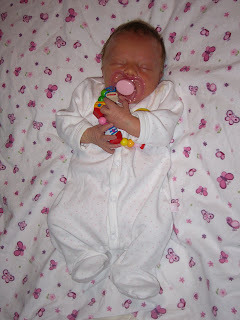 Last week I received a box of beautiful baby clothes for Little Miss Sunshine. They came from a fellow Canadian, Margaret . We are following a similar path, in terms of timing. She lost her precious Calvin just over a year ago, just as we did Nicholas. For her to go out of her way and think of us as Little Miss Sunshine's arrival approaches is nothing short of spectacular. I will treasure these beautiful, pink outfits and think of Margaret and her family each time our baby wears them. Thank you so much, Margaret. Your kindness has touched my heart deeply. In some circles, babies born to families after the loss of a child are referred to as "Rainbow Babies." The idea is that the baby is like a rainbow after a storm. "Rainbow Babies" is the understanding that the beauty of a rainbow does not negate the ravages of the storm. When a rainbow appears, it doesn't mean the storm never happened or that the family is not still dealing with its aftermath. What it means is that something beautiful and full of light has appeared in the midst of the darkness and clouds. Storm clouds may still hover but the rainbow provides a counterbalance of color, energy and hope. As we inch closer and closer to the arrival of this new little blessing I find myself so emotionally conflicted - what's new, right? I find myself dreaming of holding our baby, healthy and alive, close to my chest, smelling her fresh skin, caressing her ever so tiny baby parts. I dream of this moment and my heart is so full of love and joy and sweet anticipation. But, as soon as I feel that rush of peaceful exhilaration ... my heart almost always skips a beat ... momentarily stops ... races ... and I remember those moments with Nicholas. I wish I could say that I can always think back to that time and feel at peace, comforted by the time we had with our son. For the most part I can. But, there is almost always this looming sense of anxiety and sadness. 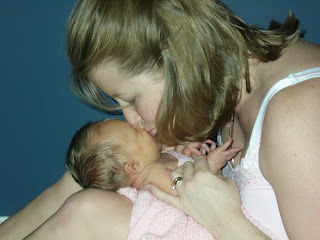 I wouldn't trade the life altering experience of losing our son, birthing him and cradling him for anything. I would welcome the feelings of horror and desperation all over again if it meant one more moment with my baby boy. There is an old folktale about a group of people, each of whom was given the chance to throw one trouble into a central heap in the middle of the room. Then they were invited to choose one from the pile. They each ended up taking back their own. This says a lot to me. It says to me that we are all a sum of our experiences - even the most painful. It says to me that if we choose to eliminate any of those experiences we also choose to deny, not only what we have learned along our journey, but also our very selves. I am constantly struggling to embrace this new life we have been faced with. I am constantly looking for the balance between joy and deep, deep, loss. If there are changes for the better that I can make, I will try to make them. But - even if I could - I will not forget my pain. I will honour it. It is part of who I am. Little Miss Sunshine is our 'rainbow'. She is the light at the end of what has been a very dark and gloomy tunnel. I am so looking forward to looking in her eyes and for her to look in mine - soul to soul. I just know how much I wish, with all my soul, that I was able to do that with her brother. Somehow, I think that Nicholas will be in that hospital room with us.... touching my soul in his own special way. Please, please, please, pray for the Henninger Family today. They lost their beautiful son, Hudson at 30 weeks and are now expecting their rainbow baby. They are currently 10 weeks weeks pregnant and going for some further tests today. Please send positive thoughts, love and prayers their way. Thank you to everyone who entered Day 4 of The 25 Days of Giveaways! I'm so glad that you all liked Nicholas' ornament. I have been really touched by the response and by all of your comments on why you would like to win this gift. I only wish, wish, wish that I could send one out to each of you! It truly breaks my heart that I can't. What a beautiful ornament. Why I would most like to display this ornament on my tree is because it was made with love from another baby lost mama with my beautiful daughter in mind. Anyone who receives it is lucky. Katy - If you see this before I have a chance to get a hold of you, please email me at lcreeves3@hotmail.com and we can arrange shipping, etc. Congratulations. I will try to make Hannah's ornament a very special one.